The team consisted of Sholanda Renois, Jamie Pollock, Candace Cabey, Traci Hobbs, Odessa Bennett-Team Captain, Shanira Francis, Earlene Horne, Candice Hunter, Apryl Freeman and Joi Freeman posed for the preliminary walk/run. 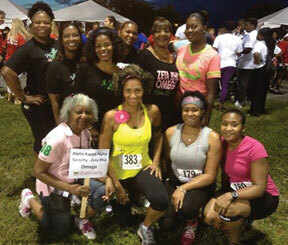 FORT LAUDERDALE, FL — Alpha Kappa Alpha Sorority, Incorporated-Zeta Rho Omega Chapter President Joeann Fletcher, First Vice President Vickie Pearcey, Programs of Service Chair, Second Vice President, Annette Johnson Hurry, fundraising chair, with other elected officers, and chapter members joined in support of the Social Justice and Human Rights Committee to participate in the 15th Annual Women in Distress Safe Walk-Run 5K Event, held at Tradewinds Park, in Coconut Creek, Fla. The spectacular event was designed to raise funds to help eradicate Domestic Violence. With approximately 1200 teams (individuals, school-aged children, and dogs) participating, the Zeta Rho Omega’s Team highlighted moment was to see all participants finish the three mile walk/run. There is still time to visit the Team Page and make a donation to be found at http://safewalk2013.kintera.org/zetarhoomega.